Home / Columnists / Why do dogs roll in foul smells? Why do dogs roll in foul smells? No-one really has a definitive answer to this question. I personally don’t believe that they do this just “because they can” or “to annoy their owners”. It doesn’t seem to fit with the way that dogs conduct themselves. I don’t believe that dogs hold grudges against humans, so by rolling in a stench is somehow going to revenge something that happened in the past. Thinking logically, I’m of the opinion that dogs may well prefer to smell of something “earthy” rather than of some human produced chemical: seems to fit with their DNA and may make them, in their eyes only, more attractive to other dogs. Having said all that, there are a number of papers on this subject that suggest that rolling in a “strong” smell may date back to pre-domestication times (approx. 15,000 years ago) when dogs had to hunt to survive. By changing their smell, they were able to deceive their prey into thinking they were a different species and potentially “drop their guard”. Dogs may have also believed that masking their own natural smell with that of another animal may ward off predators and hence survive to fight another day. Could it be that it’s just fun to roll around in another’s poop? Somehow I don’t see this because if the act of rolling around was such fun, why do dogs seem to prefer it only when there is a foul smell involved? One other theory is that certain foul smells, if rolled in by enough dogs, can somehow bond the dogs into a pack. I’m not convinced by that theory either. As we’ve discussed in previous articles, dogs have an amazing sense of smell so if us humans can hardly tolerate the stench, would this not be overpowering for a dog? Apparently not! Joining the dots on this one, if the dog can smell what its rolled in, and likes it, then it has to be tied into communication, does it not? Given this is all likely tied in with the DNA of the wolf and has little bearing on today’s domesticated dogs, we will likely never know for certain what causes this odorous activity to take place. So, as dog owners, we need to take a deep breath, let our dogs have fun at the dog park and accept that this may be one of the truly unanswerable questions of life on this earth. If anyone has any other theories, please drop me a line. 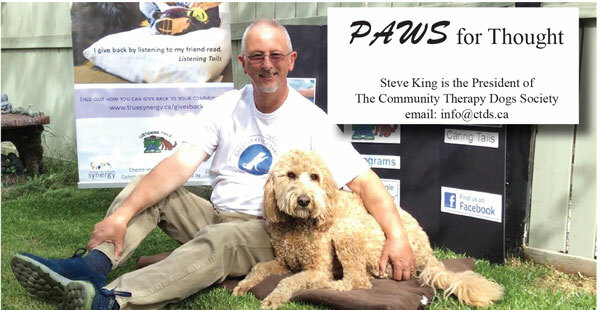 Steve King is President and Founder of Community Therapy Dogs Society, a volunteer with Lions Foundation of Canada and a dog trainer.